Then click on the name of the Call-Back Profile (1) that you wish to configure. 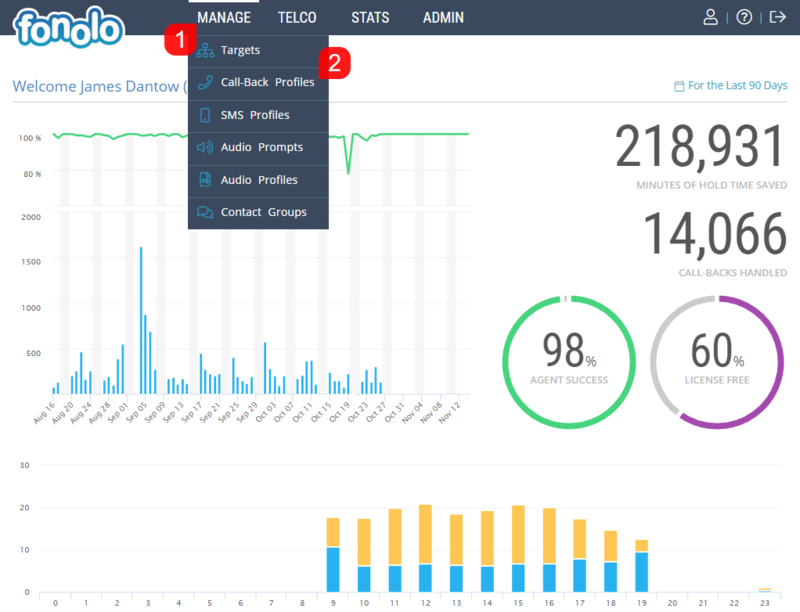 Call-Back Profile Features (1) are a combination of settings and configurations that allow you to customize the call-back experience for the Client as well as the Agent. Audio Settings (2) allow you to customize the prompts that both the Client and the Agent will hear at different points within the Call-Back process. You can either select the Default Fonolo Audio Profile, or choose a custom Audio Profile. An Audio Profile is a customized combination of Audio Prompts that you have selected to represent certain verbal commands/prompts under Manage > Audio Profiles. Audio Prompts are audio files that have been uploaded into your Fonolo Portal. Feature Settings further allow you to customize the call-back process. Duplicate Check – When enabled, each call-back number will only be able to schedule a single call-back at any one time. You can also allow Clients to be prompted to cancel a call-back or reschedule a call back when they attempt to enter their call-back number for a call-back more than once. Debug Recording – Debug recordings assist in troubleshooting issues, and only record the hold period of the call. Once the client is connected to the phone call, no audio is recorded by Fonolo. SMS Notifications allow you to select an SMS Profile for use with this Call-Back Profile. SMS Profiles provide notifications to the Client via SMS about the status of their call-back.